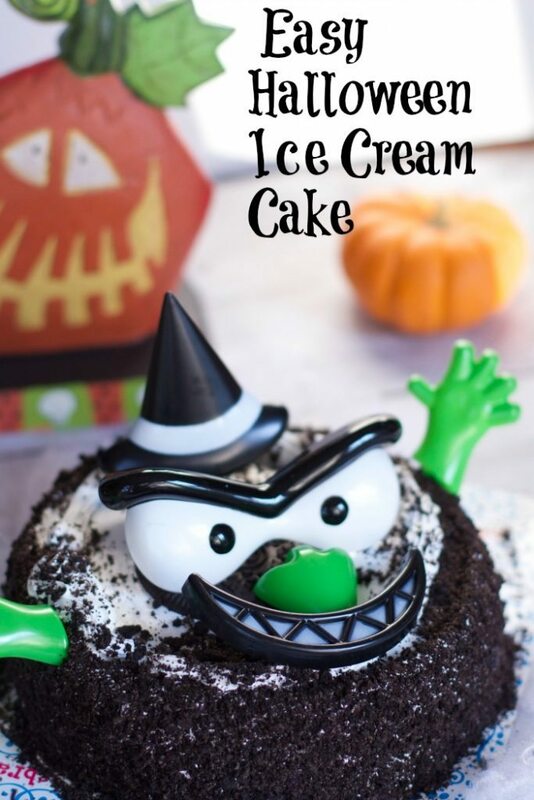 Thanks to the folks at I Love Ice Cream Cakes for teaming up with us to share this Easy Halloween Party Ice Cream Cake idea on our blog. I apologize if you are being overwhelmed with Halloween crafts and Halloween food ideas. It is truly one of my favorite holidays. If you missed the fun Halloween Cut-out Cookies and the Halloween crafts to make along with them, you must see it now. If throwing a Halloween Party is intimidating, no worries, we have some great no cook Halloween Foods and Halloween Dessert ideas that will get the party started. 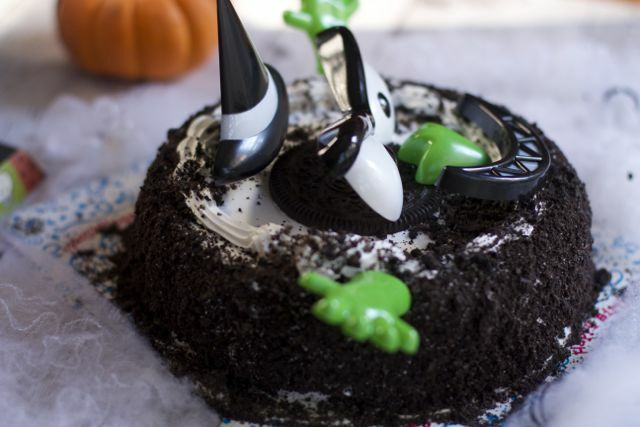 This Easy Halloween Party Ice Cream Cake is super simple and I guarantee the hardest part is not eating the cake before the party. 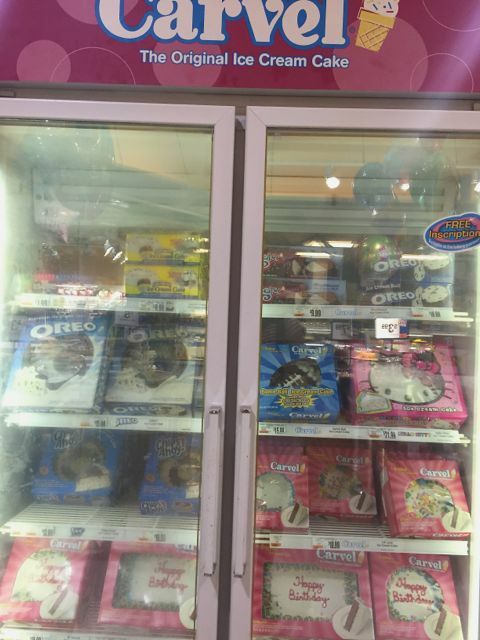 Recently I have seen these ice cream cake freezers pop up in my local grocery stores. Have you seen them? They are filled with products from I Love Ice Cream Cakes, which offers delicious frozen ice cream cakes for all occasions, available in grocery stores nationwide. The cakes come in many different styles and sizes, such as original Carvel® (including a Game Ball Ice Cream Cake), Peanuts®, Hello Kitty® and Jon Donaire®, along with delicious flavored cakes like OREO®. Who doesn’t love a good ice cream cake? Plus you can take them to the bakery and get free inscriptions! 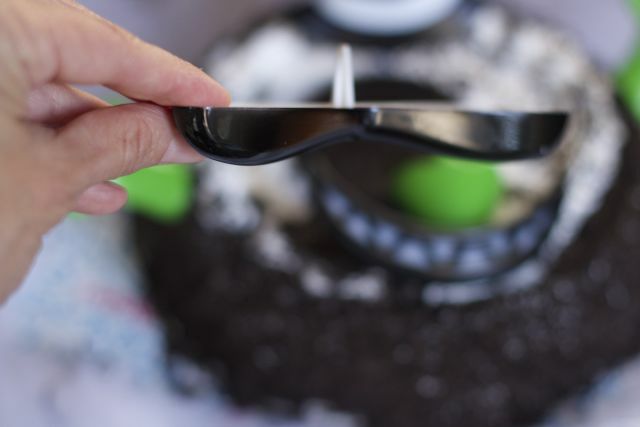 For other cake inspirations and helpful ideas, visit the Party Tips section and find an I love Ice Cream cake near you. 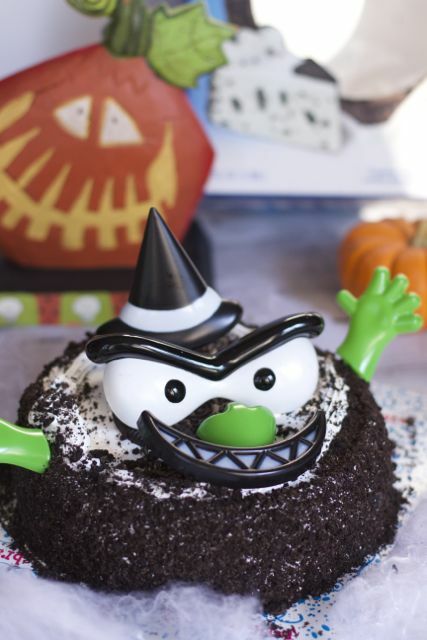 You must be wondering what goes into making this easy Halloween Party Dessert? Simple! 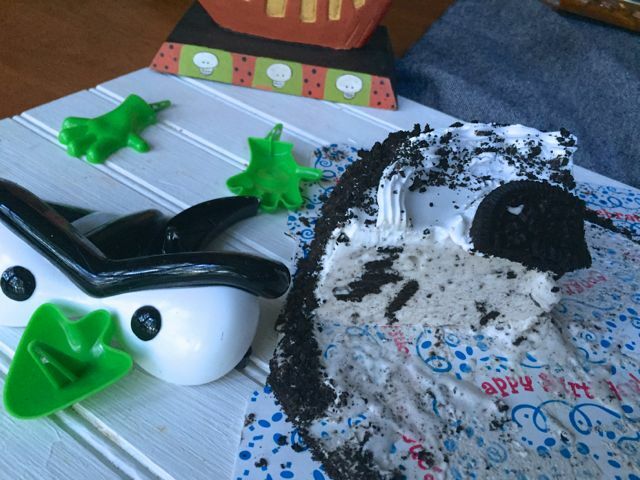 Pick up an OREO® Ice Cream Cake at your grocery store and transform it into a Halloween Party Ice Cream Cake with a few festive decorations. Simply pick up a set of those plastic pumpkin decorating pieces. You know the ones you just have to insert into your pumpkin. I happened to find some at our dollar store. 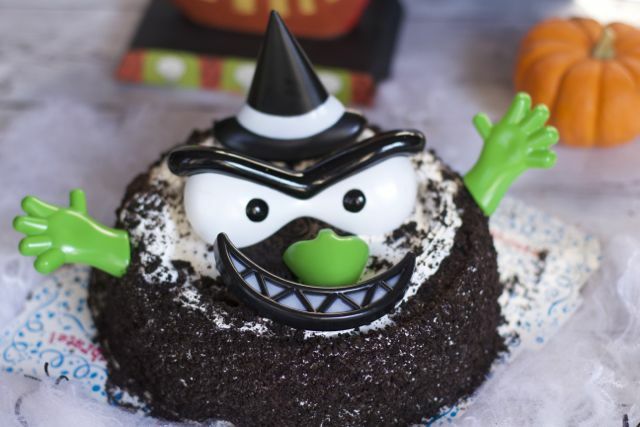 Isn’t this such a hauntingly fun Halloween Dessert that would be a crowd pleaser? The kids could help you decorate it too! Take out the pieces before you cut the cake. 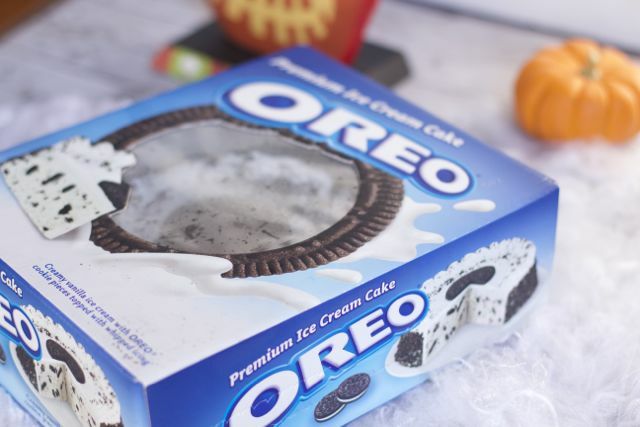 And look at all the yummy OREO® pieces mixed into this ice cream cake. My family just gobbled up their slices and so did I! If you need another festive idea for Halloween, try out I Love Ice Cream Cakes limited-edition Peanuts® Harvest Cake (in the shape of a pumpkin!). 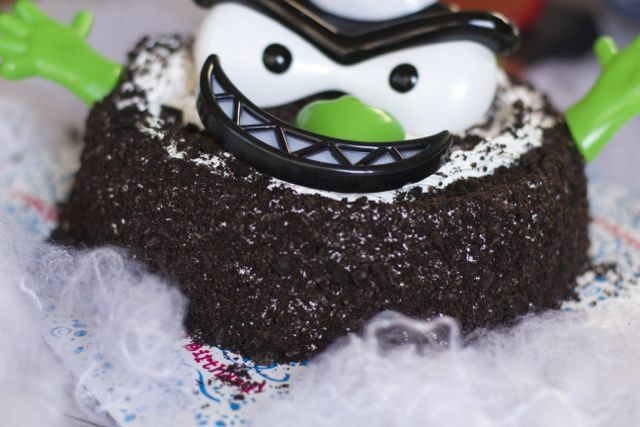 So don’t stress about an upcoming Halloween Party or a request to bring a Halloween Dessert; simply pick up one of these I Love Ice Cream Cakes. The no stress dessert people will be glad you brought it along. Be sure to join our Crunchie Club, where they’ll get product news, coupons and other info. Which I Love Ice Cream Cakes would you like to try? It looks so good and fun! I can’t wait to try it, when we host our party! This is the most fabulous idea ever for a quick but amazing Halloween party cake!! Ice cream cake is seriously the best if both worlds. This looks awesome. Drooling! I love a good ice cream and it’s so cute how you transformed it into a tasty Halloween treat! They are truly the best, we used to have a Carvel store but now glad they have them in the grocery stores. This is an awesome idea for someone like me that’s challenged in the decorating/dessert department. My kids/husband would get areal kick out of it. So easy! What a great way to make a cake a little more special. This is such a great Halloween idea. I love Carvel cakes! Then you can decorate your pumpkin too!! I love Ice Cream Cake! This is such a fun, easy way to decorate a cake. I would have never thought of that. Thanks for the good idea. That little guy is so cute. I love that you can reuse the pieces for future cakes and even change it up with different pieces. This is such a creative idea! Oh I thought those were cookie and ice cream pieces! I was going to say I didn’t think I could make them look that cute! They sort of remind me of Mr. Potato pieces. LOL!! This is so creative! I needed a recipe for a Halloween party and I’ll be sure to bookmark this!